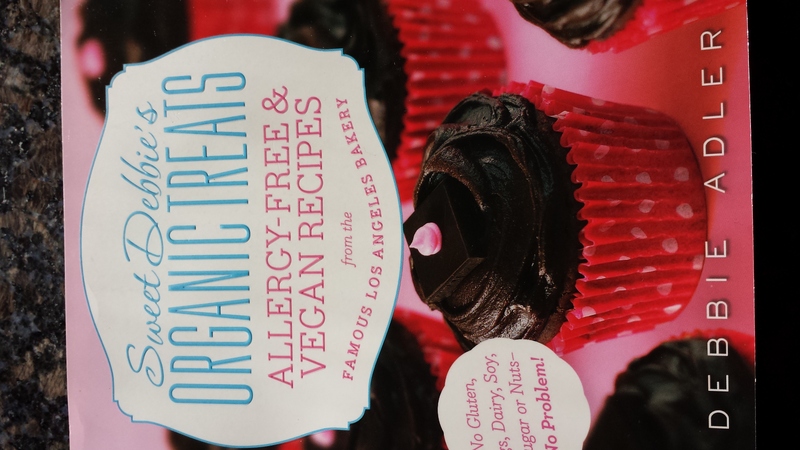 Recently I had the pleasure of trying a recipe from Debbie Adler’s new cookbook, Sweet Debbie’s Organic Treats – Allergy-Free & Organic Recipes. Before I tell you how wonderfully it turned out, let me give you some background on how I cook. I have never been one for sweets. I did not grow up in that family that had desert every night. I did not even know that existed until I was in high school. There were two reasons for my lack of appreciation of sweets, first being allergic to eggs and nuts makes it difficult to make cakes; and second my mother was quite strict when it came to sweets. We only had cakes on birthdays. We only had candy when we got our allowance. After a while, you get used to life without sweets. Now don’t get me wrong, the cakes my mom and grandmother made for my sister and I were great or so I thought! I did not realize until I was married that baked goods should not be what I had envisioned them to be all these years. Cakes were not supposed to be dry. Cakes were supposed to rise and be nice and fluffy. Who knew?! Definitely not this Allergic Traveler. The taste or consistency of the cakes did not matter to me as they were made with love. I have never eaten a chocolaty gooey cake that is drizzled with sauce and three layers high. Not only did I learn to love these egg free cakes but I also learned to bake them. Clearly if the cakes did not have eggs in them, then the consistency was not the same as if it did. Fast forward years later, there are all these great discoveries that you can use to substitute for eggs. There’s applesauce, there’s chia seeds, there’s Egg Replacer®, there’s date paste, there’s pureed black beans or xantum gum. The list goes on and on. With all these substitutes, there’s a learning curve for me. I consider myself a great cook, as I love to experiment in the kitchen, however I consider myself a lousy baker. Again for two reasons, the first being you cannot experiment when it comes to baking. Baking is a science. If you add too much of anything it could then end up tasting like chalk. I am not very experimental when I bake and it kills me to waste food. The second reason, I don’t consider myself a baker is because I don’t know what the cake should taste like if in fact it did have eggs. It’s like explaining color to a blind person. Someone who understands the color blue cannot explain it to someone who has never seen the color blue. It’s the same for people with food allergies. You can’t explain to me what eggs taste like and I cannot begin to comprehend. Because of all this, I rarely bake. However, Adler’s book addresses both concerns. She clearly explains all the substitutes of the world as well she has a healthy muffin recipe. Imagine how delighted I was upon finding such a recipe! I appreciate the fact that most children would disagree with me, but the idea of rosemary infused muffin was too tempting for me to resist. My mouth was watering as I read the description. I could hardly wait to get in the kitchen. End result? Sheer deliciousness. What a novel idea to introduce spices to muffins. If you have not had the chance to pick up this cookbook, what are you waiting for? Don’t worry there are plenty of chocolaty gooey delights as well. Preheat oven to 350o F. Line a standard 12-cup muffin tin with paper baking cups. Steam the cauliflower florets in a medium size saucepan for about 15 minutes, or until tender. Transfer the florets, a few at a time, to a potato ricer and push them through into a medium-size bowl. This will give you lumpless cauliflower puree. Mix together the rice milk and vinegar in a 2-cup measuring cup. Whish together the flour, dill, rosemary, thyme, minced onion, baking powder, baking soda, oregano, guar gum, chili powder, if using, and salt in a large bowl. Make a well in the middle. Add the cauliflower puree, rice milk mixture and grapeseed oil, and stir until the liquid is absorbed and the batter is smooth. Fold in ½ cup of the cheddar cheese. Spoon the batter into the prepared muffin tin, dividing it evenly. Each cup should be about three-quarters full. Top each with the remaining ¼ cup of cheese. Dust the top of each with a sprinkling of dill. Transfer the muffin tin from the oven to a wire rack and let sit for 10 minutes before removing the muffins to cool completely. Keep in an airtight container for up to 3 days, or wrap and freeze for about the 3 months.